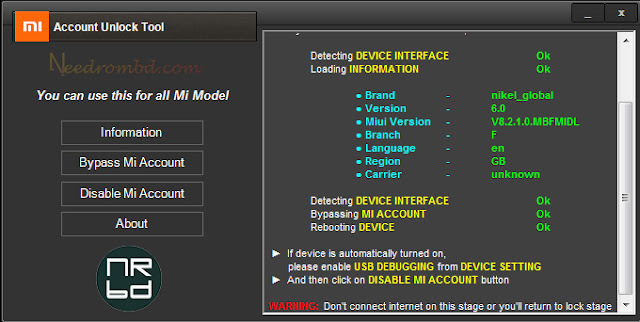 Download Mi Account Unlock Tool for free – Remove Or Bypass Mi Cloud account Verification. Mi account unlock tool is a very small Computer tool which can help you to remove or unlock your Mi account-if your device asking “this device may be associate with existing Mi account”. Same as you can remove or bypass Mi account after hard reset on any MI devices. Just download Mi account unlock tool to remove or bypass Xiaomi Mi account lock from your own Xiaomi Smartphones.